Global positioning system (GPS) technology and better routing can make trucks more productive, limiting the need for more drivers. Also, as fuel prices rise, some companies may switch their shipping to rail to lower costs. 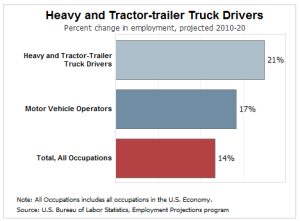 Bureau of Labor Statistics, U.S. Department of Labor, Occupational Outlook Handbook, 2012-13 Edition, Heavy and Tractor-trailer Truck Drivers, on the Internet at http://www.bls.gov/ooh/transportation-and-material-moving/heavy-and-tractor-trailer-truck-drivers.htm (visited July 20, 2012). Owner-operators are individuals who own the trucks they drive and can either lease their trucks by contract with a trucking company to haul freight for that company using their own trucks, or they haul loads for a number of companies and are self-employed independent contractors. There are also ones that lease a truck from a company and make payments on it to buy it in two to five years.